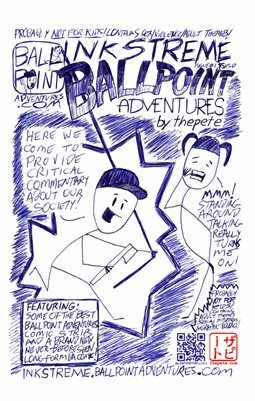 Ballpoint Adventures: BALLPOINT ADVENTURES CLASSIC from October 1, 1998: the very 1st BA comic! Click here to see the full-sized image. This is the very first BALLPOINT ADVENTURES strip EVER. Pretty cool, huh? Remember the 1990s? We really didn't have a care in the world! In order to be critical of one's culture, we needed to look back in time to a previous stupid thing humanity did. Lucky for Billy's anger level, humanity would doing a LOT of pretty stupid things in the decade to follow. Many ballpoint axes would be through and much blue inky blood would be spilled!